Giorgione (1477–1510), Portrait of a Young Man ('Giustiniani Portrait') (c 1497-9), oil on canvas, 57.5 × 45.5 cm, Gemäldegalerie, Berlin. Wikimedia Commons. … Out, out, brief candle! During the Renaissance, Venice was ideally situated for outbreaks of infectious disease. A major seaport which traded with most of the known world, it was densely populated, and in the summer the warm waters in the lagoon and canals, and its high population of rats, were perfect reservoirs. Every so often, a fresh wave of plague would sweep through the city, and a substantial proportion of its inhabitants would be stolen away to die on one of its special plague islands. In the summer of 1510, one victim who was taken to the island of Lazzareto Nuovo, and died there shortly afterwards, was Giorgio Barbarelli da Castelfranco, a young painter better known as Giorgione. His life and works are still the subject of mystery and speculation, but in his thirty-two or thirty-three years of life, he had become one of the most accomplished and celebrated artists in history. He was known to have been commissioned to paint portraits in 1500, and for an altarpiece in the cathedral of his home town in 1504. In 1507-8 there are records of him being involved in the painting of frescoes for the exterior of a building in Venice. Vasari’s account of his life claims that Giorgione met Leonardo da Vinci when the latter visited Venice in 1500 (or 1499). We also know that Giorgione was dead by October 1510. Beyond those few dates, we know almost nothing factual about his life. 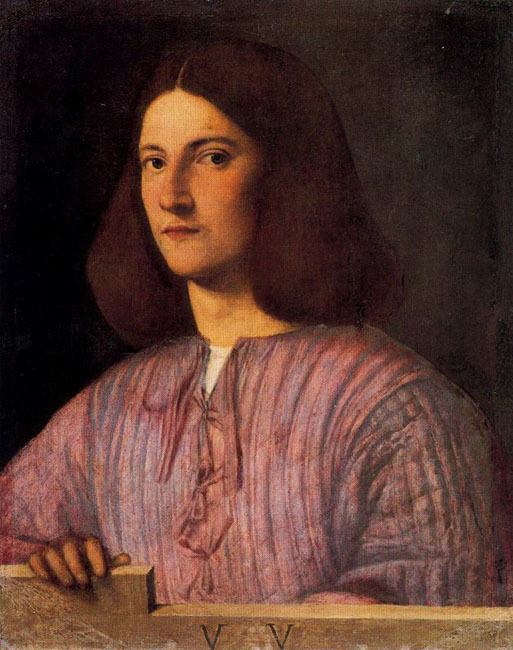 A later biographer (Ridolfi) stated that both Giorgione and Titian were pupils of Giovanni Bellini (c 1430-1516), and Vasari stated that Titian was in turn a pupil of Giorgione. All three appear to have known one another well, although whether there were simple master-pupil relationships is much less clear. His only painting which is signed and dated is the portrait of ‘Laura’ from 1506. A small core of his surviving works match those described in the notes, between 1525 and 1543, of the Venetian collector Marcantonio Michiel. Vasari’s attributions are confusing, and changed across the different editions of his book. Over the years, art historians and connoisseurs have attributed more than a hundred paintings to Giorgione, but current experts are only generally agreed over some forty. This article will cover most of those currently considered to be painted by Giorgione before 1505; the next and final article on his work will cover those from 1505 to his death. 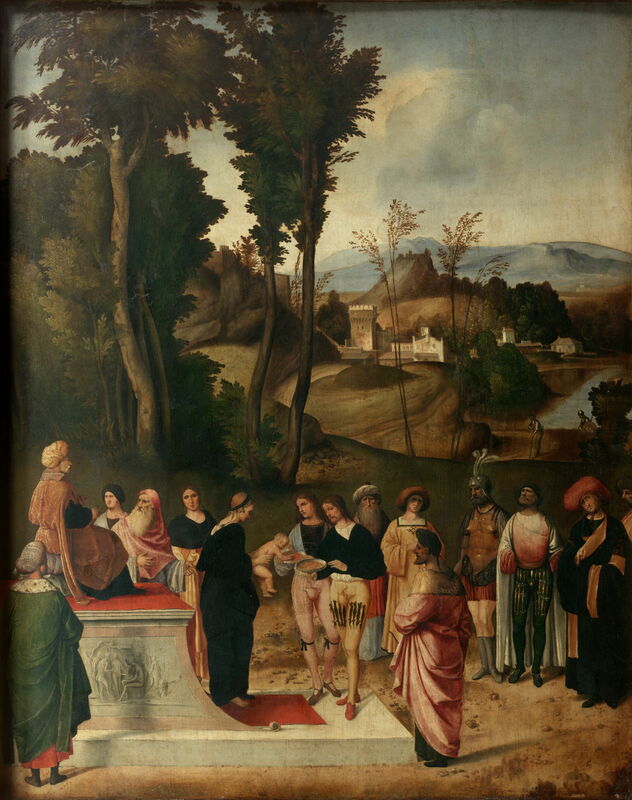 Giorgione (1477–1510), Trial of Moses (c 1496-9), oil on panel, 98 x 72 cm, Galleria degli Uffizi, Florence. Wikimedia Commons. Trial of Moses (c 1496-9) shows the infant Moses, held by a woman dressed in black robes, about to take and put a hot coal in his mouth. Two pages offer the infant bowls, one containing hot coals, the other gold coins. Presiding over this is the Pharaoh, seated on his throne, who has turned to an old scribe with a suitably luxuriant beard. The scribe had proposed that Moses should be killed for having thrown down the Pharaoh’s crown when it was tried on his head, leading to this trial by fire. This story is not based on any Biblical account, but the apocryphal manuscript Antiquities of the Jews, by Flavius Josephus, from the first century CE. The painting is a pendant to Giorgione’s Judgement of Solomon. Various proposals have been made for collaborators, but none seems to have gained much support. The landscape shown behind the gathering in the foreground is very naturalistic and innovative for its time, particularly in the Southern Renaissance. The whole painting is an astonishing achievement if it is dated correctly, putting its creator’s age between 19 and 22 years. Giorgione (1477–1510), Portrait of a Young Man (‘Giustiniani Portrait’) (c 1497-9), oil on canvas, 57.5 × 45.5 cm, Gemäldegalerie, Berlin. Wikimedia Commons. Portrait of a Young Man (‘Giustiniani Portrait’) (c 1497-9) is one of the few unanimously-agreed portraits painted by Giorgione, out of many which have been attributed. The identity of the sitter is unknown. It is also agreed that it is an early portrait, and a remarkable achievement by a 20 to 22 year old. Unfortunately the letters V V were added in the 1800s, during a restoration. 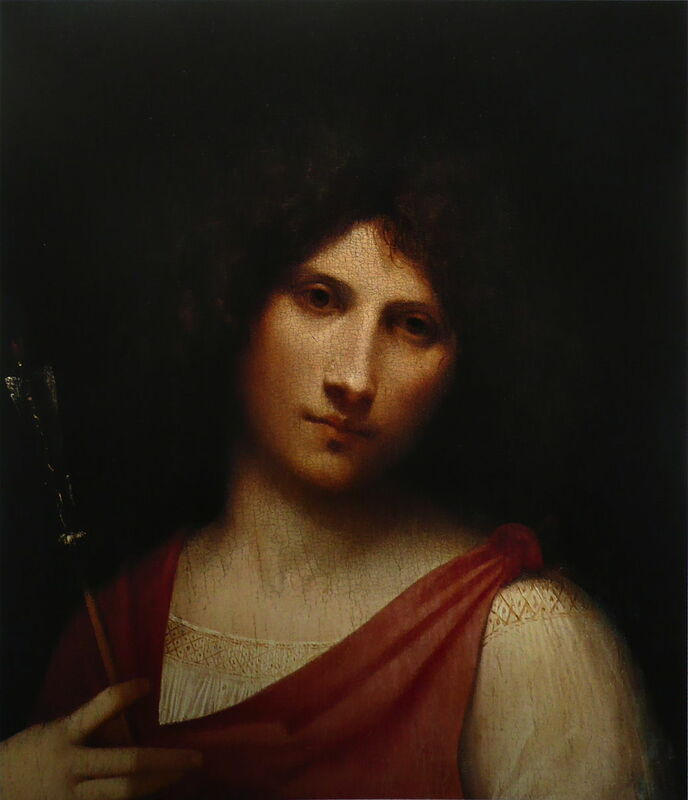 Giorgione (1477–1510), Boy with an Arrow (c 1500), oil on panel, 48 × 42 cm, Kunsthistorisches Museum, Vienna. Wikimedia Commons. Boy with an Arrow (c 1500) is another brilliant portrait, which appears one of the more soundly attributed to Giorgione, according to Michiel’s account from 1531. His subtle modelling of this face may reflect what he learned from his meeting with Leonardo da Vinci in 1499 or 1500. 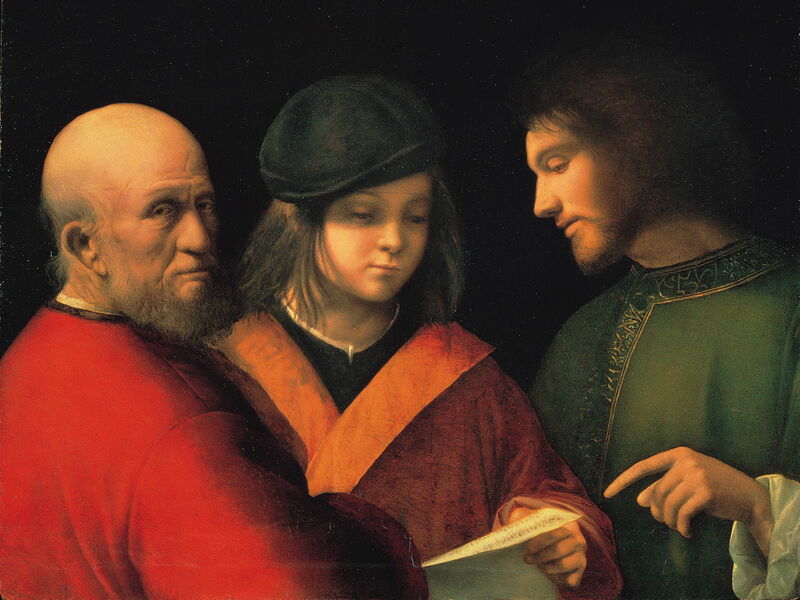 Giorgione (1477–1510), The Three Ages of Man (c 1500), oil on panel, 62 × 78 cm, Palazzo Pitti, Florence. Wikimedia Commons. The Three Ages of Man (c 1500) is usually interpreted as an allegory, in which the young boy’s musical training by the older men is seen as an attempt towards a more universal harmony. The attribution of this painting remains controversial, as does its date. The faces are very lifelike and expressive, and it is clearly from the hand of a master. 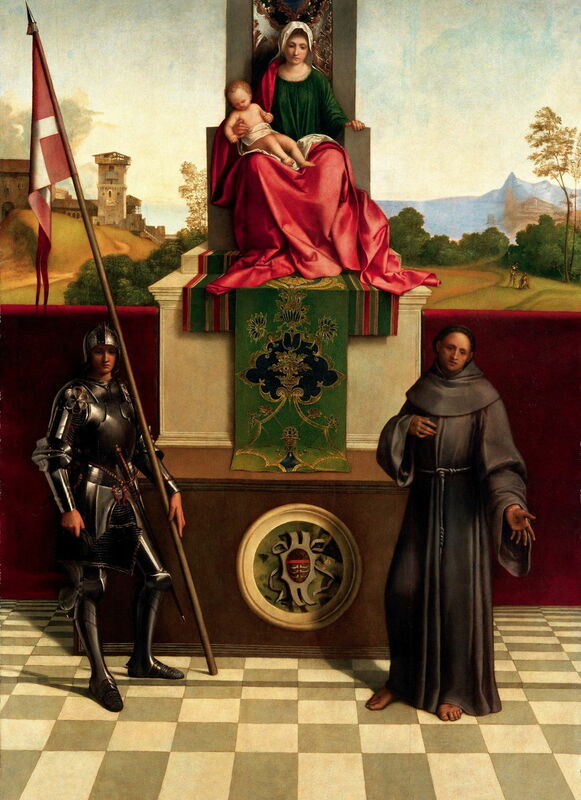 Giorgione (1477–1510), Virgin and Child with Saint Nicasius and Saint Francis of Assisi (‘Castelfranco Altarpiece’) (c 1500), oil on panel, 200 x 152 cm, Duomo di Santa Maria Assunta e San Liberale, Castelfranco, Veneto, Italy. Wikimedia Commons. Virgin and Child with Saint Nicasius and Saint Francis of Assisi (‘Castelfranco Altarpiece’) (c 1500) is not only one of the most reliable attributions, but its date is also fairly secure. It is one of Giorgione’s most brilliant paintings, combining a fine depiction of the Virgin and Christ child with two wonderful saintly figures – Nicasius’ armour is spectacular – and an innovative naturalist landscape. The buildings at the upper left are meticulously painted, and there is excellent aerial perspective at the upper right. At this time, Giorgione was still only 23. Giorgione (1477–1510) Virgin and Child in a Landscape (1500-05), oil on panel transferred to canvas, 44 × 36.5 cm, Hermitage Museum, Saint Petersburg, Russia. Wikimedia Commons. 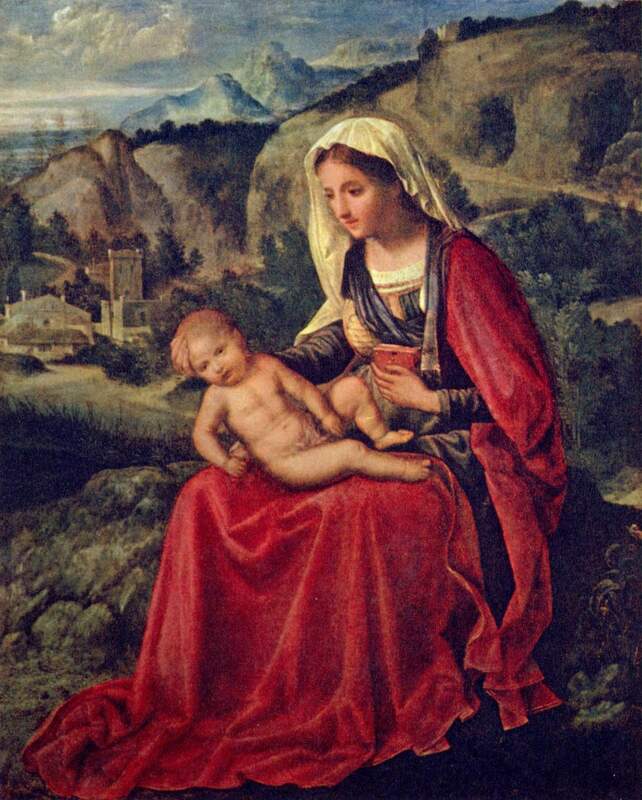 Virgin and Child in a Landscape (1500-05) has become more accepted as one of Giorgione’s works in recent years, although the range of dates proposed is wide, from 1495 to 1507. Here the Virgin, supporting the infant Christ’s head in her right hand, is sat on a rock overlooking a small village. The landscape is detailed, and shows good aerial perspective where it becomes mountainous in the distance. Giorgione (attr) (1477–1510), The Virgin and Child (‘The Tallard Madonna’) (c 1500-05), oil on panel, 76.7 × 60.2 cm, The Ashmolean Museum, Oxford. Wikimedia Commons. The Virgin and Child (‘The Tallard Madonna’) (c 1500-05) is a more controversial attribution. Its first documented owner, the Duc de Tallard (hence its nickname), claimed it as a Giorgione, but ever since that first public appearance in 1756, opinion has been divided. 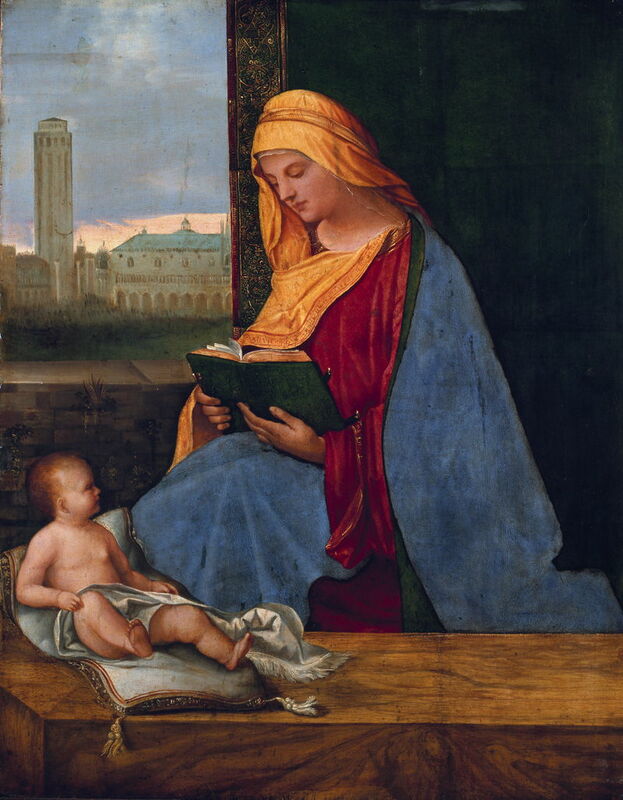 It shows the Virgin reading a book, with the infant Christ sat in front of her. The view through the window is even more fascinating, as it shows the Campanile and Palazzo Ducale by Piazza San Marco in Venice. It is one of the works featured here in the history in paintings of that square. Giorgione (attr) (1477–1510), Knight and Groom (c 1502), oil on canvas, 90 x 73 cm, Galleria degli Uffizi, Florence. Wikimedia Commons. Knight and Groom (c 1502) is also a more doubtful attribution, although some have linked its black armour with that shown on Saint Nicasius in the Castelfranco Altarpiece above. 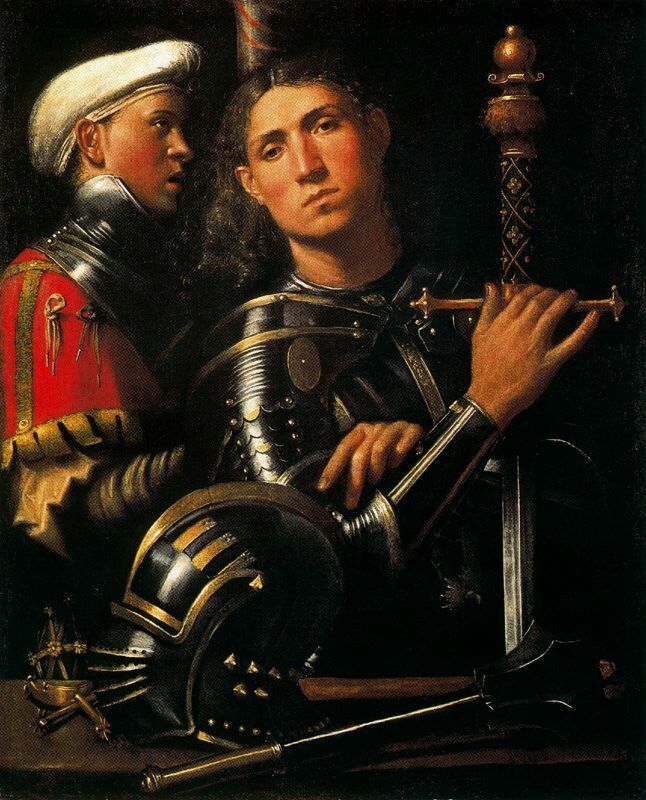 The modelling of the two faces is not in keeping with earlier works by Giorgione, but the superb detail in the armour, dress, and weapons suggests a masterly hand. Whoever did paint this, it may represent Bishop Jacopo Pesaro on the eve of his departure for the 1502 naval battle between Venice and the Turks, a subject which overlaps with a painting known to be by Titian. Giorgione (1477–1510), Judith (c 1504), oil on canvas transferred from panel, 144 x 66.5 cm, Hermitage Museum, Saint Petersburg, Russia. Wikimedia Commons. Judith (c 1504) seems to have become one of the more secure attributions, and likely to date between 1500 and 1504. It is an unusual and brilliantly painted full-length portrait of the Biblical Judith, with her left foot resting on the severed head of Holofernes. Full details of that narrative are here. This is another astonishing painting with a high degree of naturalism in both the figure and the surrounding setting and distant landscape. The next article concludes by considering eleven paintings attributed to Giorgione from 1505 through to his untimely death in 1510. Facchinetti S & Galansino A (2016) In the Age of Giorgione, Royal Academy of Arts. ISBN 978 1 910350 26 3. Posted in General, Painting and tagged Bellini, da Vinci, Giorgione, Judith and Holofernes, painting, San Marco, Titian, Venice. Bookmark the permalink.